This is the sixth installment of our blog series exploring the articles in the special issue on “Fake News” from the Journal of American Folklore (vol. 131, no. 522). 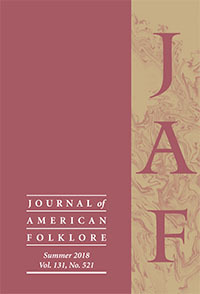 The special issue on “Fake News” from the Journal of American Folklore (vol. 131, no. 522) is available in print and on JSTOR now. Like many other contributors to this special issue, I came to the topic of fake news through personal experience. After sharing on Facebook a useful-seeming link to a list of untrustworthy news sites (a link I discovered only because someone I follow had previously posted it), I suddenly found myself being touted as the “authority” behind the information when one of my friends questioned another mutual friend’s subsequent re-sharing of the link: “Well, Lynne S. McNeill shared it, and that’s good enough for me!” Well, that definitely shouldn’t have been good enough for them. I will freely admit that I didn’t fact check the link at all–it came to me, too, from a trustworthy friend, and the sources cited in the link suggested a familiar and believable (to me, at least) source: a university professor interested in compiling accurate data. I didn’t know the professor, I didn’t check to make sure she was actually on the faculty of the university listed, in fact I didn’t even bother to see if she was a real person at all. In short, I wasn’t being a very good folklorist, but I was definitely being a very typical member of the folk. My article considers this conundrum. When we engage in social media in the course of our everyday lives, not as scholars but just as people, how do we determine what kinds of information are trustworthy or not? It appears that far more important than any news outlet named or pictured, more important than any website or publication house listed, it’s the person who shared the information that drives our sense of its veracity. There’s a clear offline precedent for this: when a close friend or family member says to me, “Did you hear what the president said this morning?” I typically don’t pause to consider that they may be lying, or even simply misinformed. I mentally place the information into the generally unacknowledged folk category of “something that happened,” and it then begins to shape my expectations about what may happen next. While efforts to teach fact-checking skills to young people are certainly important and well intended, we face a much greater challenge on the folk level to begin to consciously consider our own perceptions of authoritative transmission.